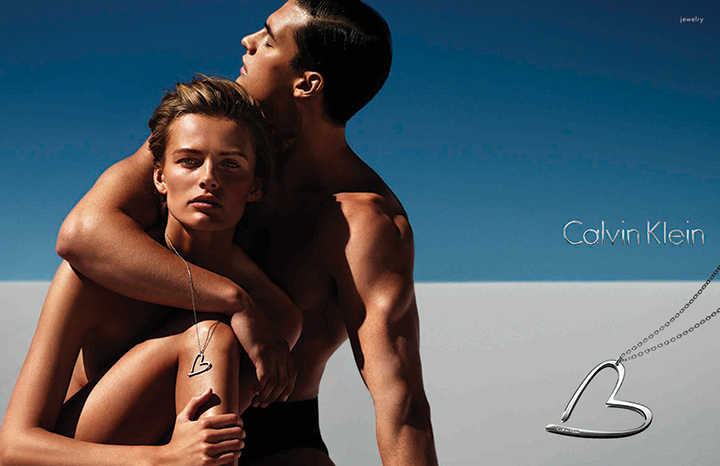 Calvin Klein today released the brands latest watches and jewelry advertising campaign. Shot in Los Angeles, California, by photographer Mario Sorrenti, the vibrant new campaign features models Edita Vilkeviciute and Matthew Terry. The sensual and iconic creative highlights the agile and feminine Calvin Klein body watch for her and the sophisticated, essential Calvin Klein time unisex style. The visuals also showcase the delicate and refined Calvin Klein joyous heart shaped pendant. Edita Vilkeviciute also appears in the Spring 2014 advertising campaign for the Calvin Klein white label brand. Additionally, Matthew Terry has been featured in several campaigns for the house, including the global advertising campaigns for Calvin Klein Collection (Fall 2013); Calvin Klein Underwear (Fall 2013, Spring 2013 and Spring 2012); and, Calvin Klein Jeans (Spring 2012). He is also the current face of Calvin Klein’s DARK OBSESSION for men fragrance. This campaign brings the print advertising to life in a video which serves as the centerpiece of the campaign – and which will first be seen online on Calvin Klein’s social media channels beginning today.